It was time to retire and modernize the hardware in my initial working version of Convergence Jukebox. This time around I needed to use Windows 10 as network viruses kept crashing my old no longer supported Windows 7 computer. My computer of choice for this installation was the ASUS TS10 VivoStick. While the $165.00 (CDN) TS10 VivoStick specs aren’t impressive, the stick computer does contain a Quad-Core Intel Atom x5-Z8350 processor which includes Intel HD Graphics. It also has two Full Size USB ports (including 3.0), a headphone jack, Bluetooth, Wi-Fi, 32GB of Flash Storage and –most important– it comes with Windows 10 home. When I added a generic ($35 CDN) 128 GB 3.0 USB stick as drive D, the total cost to test it out $200 CDN. This total price was a bargain given the VivoStick with Windows 10 installed was the same price ($165 CDN) as purchasing Windows 10 Home software from Microsoft Canada. And most important for this project is that the VivoStick has hardware specs that should be enough to run Convergence Jukebox. One additional piece of hardware I needed was a 4-port powered USB 3.0 HUB as the Convergence Jukebox configuration requires 3 USB connections. The bottom line…. It works. And it pretty much worked right out of the box using Convergence Jukebox For Windows v0.3 software and it works with the WeaveFuture Coin Acceptor. However I did have some work to do in getting the hardware operational. First I went through the process of speeding up Windows 10 with the help of this article titled “How to speed up Windows 10 By Nate Drake“. Because the TS10 only has 32GB of Flash Storage reducing the footprint of Windows 10 on the VivoStick was a priority. I started by uninstalling and erasing all of the unnecessary software on the Flash storage. I did not use PC Decrapifier because I wanted to closely review the software I removed because I did not want to accidentally erase required Audio and Video drivers. I did remove the VivoRemote software and all of ASUS’s product management tools as part of the process to reduce the footprint. Despite reading numerous online articles that indicated one would only have 4 gig remaining, I was able to free up 10 gig of flash drive space after being persistent. I was able to achieve this using a new piece of public domain software called BleachBit. BleachBit freed up almost 6 gig of flash drive space after I had exhausted all my usual bag of tricks so it was worth using. There was one other piece of software I had to employ. The latest features update of Windows 10 proved to be too large to install on the VivoStick. It downloads onto the VivoStick but in order to install it needs 16-20 gigs of storage space. Windows update kept sending update error messages to the screen which overrode the Jukebox app. To overcome this I used wushowhide which is a troubleshooting app from Microsoft that allows you to show or hide Windows Updates. It allowed me to stop the update until I can find a better solution. In addition rather than install the Convergence Jukebox For Windows v0.3 to drive C, I installed it to drive D given its 128 GB disk size. One last thing. While transferring my library of songs I reached a limit of what I could transfer to the generic ($35 CDN) 128 GB 3.0 USB stick that I use as drive D. It turned out that the USB stick was formatted as FAT32 which has limitations. A quick reformat of the USB stick to NTFS solved the problem. We just added a patch to the original version of Convergence Jukebox bringing it up to version 0.4. If you’re having trouble getting a coin machine functioning directly with Convergence Jukebox run coinreader.exe. It’s a Python program that waits for the <x> key to be pressed. When it’s run coinreader.exe creates a file called credits.txt with 0 value. When coinreader.exe reads an <x> generated from a WeaveFuture Coin Acceptor it adds a credit the credits.txt file. When Convergence Jukebox senses the credits.txt file it looks for a change to credits.txt 60 times per minute. When it senses an update the credits are are reflected immediately on the GUI. If no credits.txt file is found Convergence Jukebox acts exactly like it did in version 0.3. When a credit is used it’s subtracted from the credits.txt file and the Jukebox GUI screen is updated. 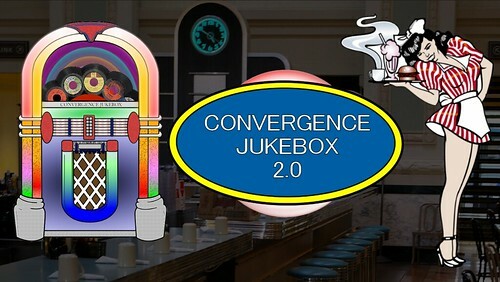 Here are the latest designs of the Convergence Jukebox KIVY based opening screen with its new retro look. As well I added some more test animation or the opening screen. As I complete the software the blue oval will update users about where they are in the start-up sequence as the records shuffle via animation. L. Allen Brewer at Flickr for the diner background image. Its licence is an Attribution 2.0 Generic (CC BY 2.0) and I altered the images brightness to make the foreground graphics stand out. The Diner Girl vector graphic licence is also an Attribution 2.0 Generic (CC BY 2.0). The Old School Jukebox Line Art licence is an Attribution-NonCommercial-ShareAlike 3.0 Unported (CC BY-NC-SA 3.0) licence. In creating this version I added colour, labels and altered the turntable display. The oval message display area started as Doo Wop line art from OpenClipart.com. It was created by a member named lmproulx and is licenced as a CC0 1.0 Universal (CC0 1.0) Public Domain Dedication. A preliminary version of Convergence Jukebox 2.0’s KIVY based opening screen. The records inside the jukebox will spin at start while the software retrieves or builds the database of songs. The blacked out area will provide visual feedback of the progress of either the building or the loading of the database.